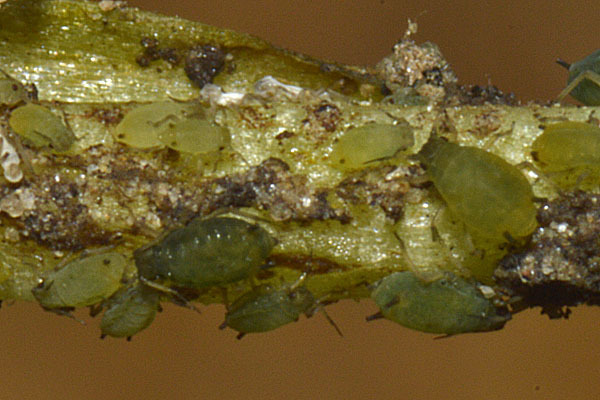 Aphis crepidis apterae are dark bluish-green to yellow-green, and are not wax powdered (see first picture below). The dorsum of Aphis crepidis is membranous apart from a rather faint short dusky spinal bar on tergite 8, and marginal tubercles are prominent. The femora and proximal tibial hairs are shorter than the least width of the tibia. The siphunculi are dark. The cauda is dusky and bears 6-11 hairs (cf. 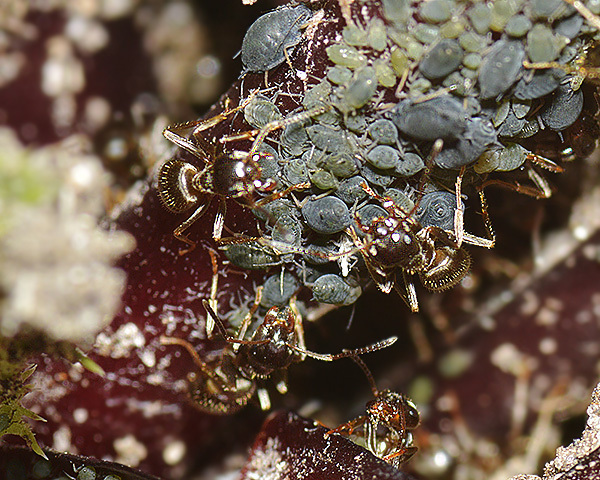 Aphis hypochoeridis which has 4-8 caudal hairs). The body length of Aphis crepidis is 1.2-2.0 mm. Aphis crepidis is very closely related to, and apparently morphologically indistinguishable from, Aphis taraxacicola which feeds on dandelion, not hawksbeard. The hawksbeard root aphid lives in ant shelters (see second picture above) at the base of rough hawksbeard (Crepis biennis) and smooth hawksbeard (Crepis capillaris). It does not host alternate and sexual forms have been found in September. Stroyan (1984), reports that Aphis crepidis is very little known in Britain (only Cambridge and Derby), but comments that the species is perhaps overlooked, a common problem for all the root feeders. It has recently been reported from Wales (Baker (2009)) and now (our own observations) from Rye Harbour in East Sussex. Aphis crepidis is found throughout Europe, apart from the north, and extends into Iran. The host plants of Aphis crepis, smooth hawksbeard (Crepis capillaris) (see picture below) and beaked hawksbeard (Crepis vesicaria), are common at Rye Harbour in East Sussex, especially on old shingle ridges and near the edge of salt marsh areas. 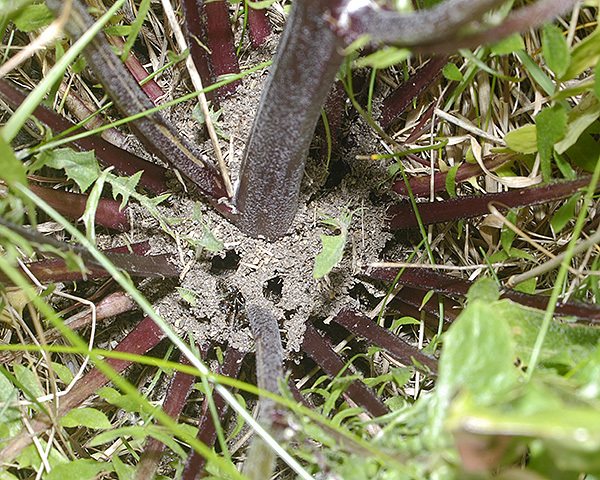 Aphis crepidis were feeding on the hawksbeard in ant shelters at the base of the plants (see picture below). All the colonies we found were attended by the common black ant Lasius niger (see picture below). Baker (2009) found Aphis crepidis feeding sheltered and attended by the ant Lasius niger on basal and subterranean parts of Crepis capillaris growing on amenity grassland at Cardiff Bay, Wales. 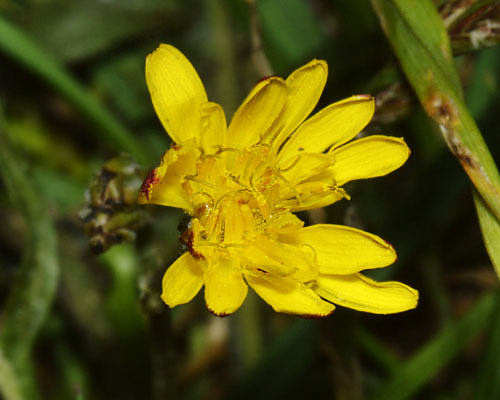 He also found the same species on subterranean and rarely the upper parts of a Crepis species growing beside a pebble beach at Barry, Wales. 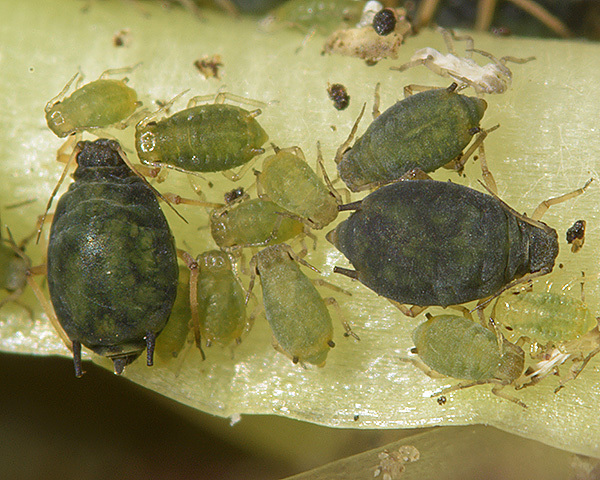 Immatures of Aphis crepidis (see pictures above and below) are a markedly paler green than the adults. Baker (pers. comm.) has recorded Lysiphlebus fabarum as a parasitoid of Aphis crepidis in Wales. Barahoei (2014) has recorded Aphidius matricariae as a parasitoid of Aphis crepidis in Iran. Blackman & Eastop list 11 species of aphid as feeding on rough hawksbeard (Crepis biennis) worldwide, and provide formal identification keys. Of those aphid species, Baker (2015) lists all 11 as occurring in Britain: Aphis crepidis, Aphis fabae, Aulacorthum palustre, Aulacorthum solani, Brachycaudus helichrysi, Hyperomyzus picridis, Myzus ascalonicus, Nasonovia ribisnigri, Trama troglodytes, Uroleucon cichorii and Uroleucon grossum. Blackman & Eastop list 15 species of aphid as feeding on smooth hawksbeard (Crepis capillaris, Crepis virens) worldwide, and provide formal identification keys. Of those aphid species, Baker (2015) lists 14 as occurring in Britain: Aphis crepidis, Aphis fabae, Aphis nasturtii, Brachycaudus cardui, Hyperomyzus lactucae, Macrosiphum euphorbiae, Myzus ornatus, Nasonovia ribisnigri, Pemphigus bursarius, Trama maritima, Uroleucon cichorii, Uroleucon grossum, Uroleucon murale and Uroleucon sonchi. Blackman & Eastop list 10 species of aphid as feeding on beaked hawksbeard (Crepis vesicaria, Crepis haenseleri, Crepis taraxacifolia) worldwide, and provide formal identification keys. 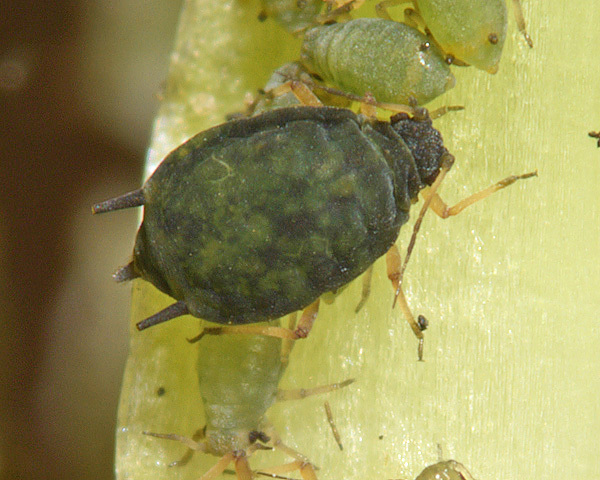 Of those aphid species, Baker (2015) lists all 10 as occurring in Britain: Aphis crepidis, Aphis gossypii, Aulacorthum solani, Hyperomyzus lactucae, Myzus ornatus, Myzus persicae, Nasonovia ribisnigri, Uroleucon cichorii, Uroleucon grossum and Uroleucon sonchi. We especially thank Rye Harbour Nature Reserve for their kind assistance, and permission to sample.